For making this Womens Multi Colour leather handbags 4 different colour leather are used. 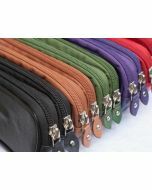 Treat yourself to a premium leather bag from the Multicolour BUTTERFLY range of leather bags and wallets from Real Leather. With Cross-body straps you may wear this bag hands-free. Second set of handles are for carrying the same bag as a Shoulder Bag. Spacious interior of this leather bag ensures ample space for all of your essentials. 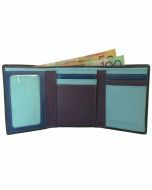 Includes a zip pocket for coins and smaller items. There is a pouch for your mobile phone, for easy retrieval. Our beautiful products are made from genuine natural cowhide leather. They are designed to age and soften over time. This will create an unique feel to your bag over time. As we use a coloured leather, any marks are a natural grain imperfection that has appeared naturally giving the bag its personality and authenticity.